We’re in Atlanta this week, and invited some fellow Canucks to come and watch the football playoffs. So, other than picking up a case of Molson Canadian, I wanted to make something that was a tip of the cap to the Great White North. 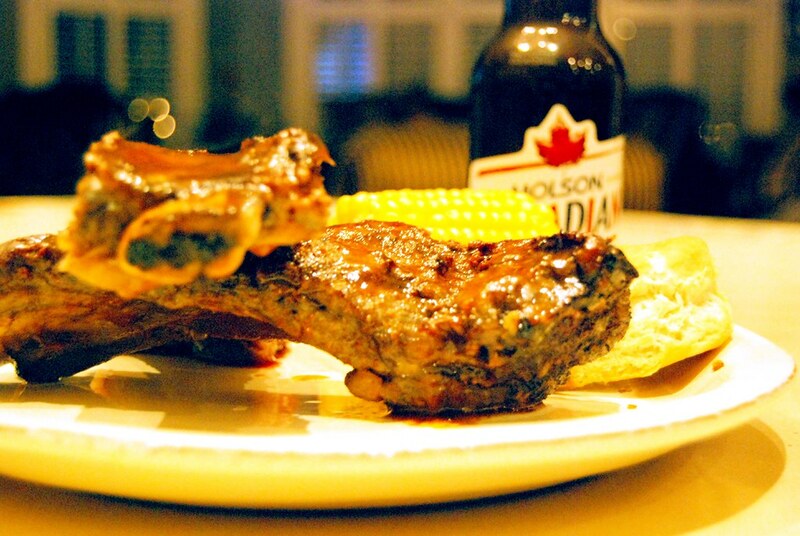 These massive slabs of beef ribs start out with a flavour packed spice rub and are then mopped with a sauce which includes beer and maple syrup. Outstandingly delicious and… mission accomplished, eh? * – Grade A syrup is your standard table-top variety. Grade B Maple Syrup is suited more for cooking and has a more intense maple flavour for this purpose. In a small bowl, whisk together the garlic powder, salt, mustard powder, brown sugar and 2 tablespoons of the paprika. Set aside about 1 1/2 tablespoons of the rub, and rub the rest over both sides of the ribs. Cover and refrigerate for 1 hour. Preheat the oven to 325 degrees F. With the beefier side down, wrap each rack of ribs in foil like a package. Place them on a rimmed cookie sheet or shallow roasting pan. Cook until the meat is very tender, about 2 hours. Take the cookie sheet out of the oven and increase the temperature to 450 degrees F with a rack in the second highest position. Unwrap the ribs carefully, pour off any accumulated fat/drippings, and replace the ribs on the foil in the pan. In a small saucepan, whisk together the beer, maple syrup, and cider vinegar. Using a basting brush, mop both sides of the ribs well with the mixture, finishing with the beefier side up. Reserve the remaining sauce. Sprinkle the reserved spice rub over the beefier side of the ribs and cook them in the oven for about 10 minutes until glazed and crusty. While the ribs are finishing, whisk the remaining 1 teaspoon of paprika and the ketchup into the reserved sauce. Simmer it over Medium heat for 5 to 7 minutes until slightly thickened. Adjust seasoning to taste. Cut the ribs to separate them once removed from the oven, and brush liberally with the sauce.